The greatest enjoyment is dine-in at the casual yet elegant Neiman Marcus Cafe. But if you over-order it can go home with you in a Neiman Marcus A-Go-Go Cafe Takeout Bag. The Cafe bag branding is different than the store shopping bag. It also almost positions the NM Cafe as a take-out source directly. I wonder if the Monkey Bread and Strawberry Butter appetizer and pre-meal chicken soup apéritif are to go too! 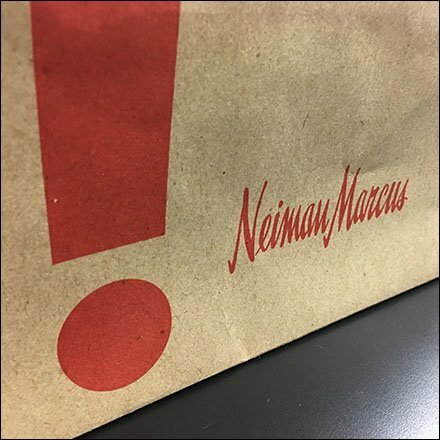 This Neiman Marcus A-Go-Go Cafe Takeout Bag from the Short Hills Mall, Chatham NJ eatery.